Don't expect Metro: Last Light to turn up on Nintendo's new console anytime soon. The Wii U is finally here and unlike its underpowered predecessor, its library will feature a number of high-profile shooters, like Black Ops 2, Aliens: Colonial Marines and Homefront 2. One game it probably won't be getting, however, is Metro: Last Light, the upcoming sequel to Metro 2033. Why? For one thing, "[The] Wii U has a horrible, slow CPU," as 4A Games Chief Technical Officer Oles Shishkovtsov put it rather bluntly. Huw Beynon, THQ's global communications manager, was a little more diplomatic about it. "We had an early look at it, we thought we could probably do it, but in terms of the impact we would make on the overall quality of the game - potentially to its detriment - we just figured it wasn't worth pursuing at this time," he told Now Gamer. "It's something we might return to. I really couldn't make any promises, though." One problem facing the Kiev-based 4A Games is a simple lack of manpower. 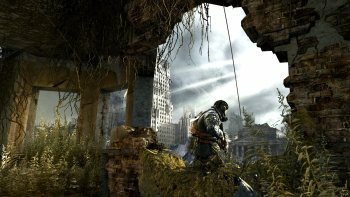 Metro 2033 was released only for the Xbox 360 and PC, and Beynon said that developing the PlayStation 3 version of Metro: Last Light represents a "significant addition" to the workload. And unlike heavyweights Activision or Electronic Arts, which can bulk up studios as necessary or even bring in entirely separate studios to help out, Metro publisher THQ is currently in no position to offer any sort of practical assistance. Metro: Last Light is slated to come out sometimes in 2013 for the Xbox 360, PlayStation 3 and PC.